This week, for National Poetry Month, I present Hodgson’s poem, “The Pirates”. Unlike most of Hodgson’s poetry, it was published during his lifetime. It first appeared as part of his collection, THE LUCK OF THE STRONG (Eveleigh Nash, 1916), and later in the posthumous collection, THE CALLING OF THE SEA (Selwyn & Blount, 1920). This poem shows Hodgson’s ability at conjuring images from words and rings with the air of a traditional sea chanty. And the thud of bare feet on the deck! Aoi! foot it, my lads! Drink to the joy of our life. On the lip of the sea. Rolling as mad as us! Lord! what a jolly mad fight! Aoi! we’re bad and we’re bold! Dieu! what a grand notion! On the walls of far heaven. Dance! All the gods damn you! Prance, you sons of Satan, prance! Make the rounded decks to drum! Gods of Thunder, yelp and wonder! See us make her bounce and wander . . .
Make her heave and roll. Till God rocks upon His throne! Dance each marrow bone . . . Thud! Thud! Aoi! Hand the bucket . . . damn the glass! Aoi! we’re right and tight! Lords of Darkness in the Everlasting Night. 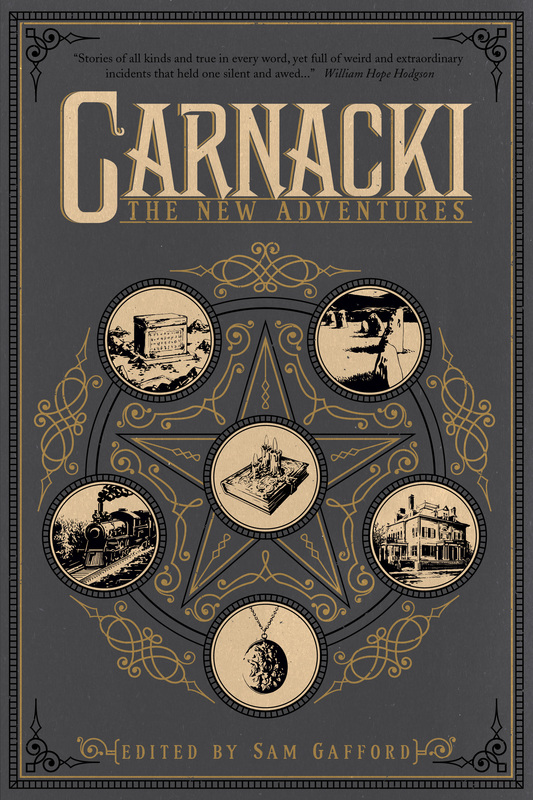 After getting some much needed feedback, I’ve decided to go to a second edition for CARNACKI: THE NEW ADVENTURES. There’s been a few people who have pointed out textual problems and concerns over the interior design so we’re going to reformat the book and re-release it next month. The cover and contents will remain the same but the text and design will be different. I feel it is my obligation to provide the best book possible for the contributors and the readers. So, on April 15th, I will remove the book from Amazon’s currently available list. The 2nd edition will be available in May and I’ll alert everyone when it can be ordered. Which means that you only have until the 15th if you want a first edition of this book. After that day, the only way you’ll be able to get a first edition will be from book dealers.